Does your child find something wrong with just about everything? Are simple requests to do chores or homework met with meltdowns? Have you run out of ideas for cheering on your rigid perfectionist? If your child's negativity is wreaking havoc in your home, Dr. Susan Van Scoyoc is ready to help! She is a parent and board-certified child psychologist with over 20 years of experience helping overwhelmed parents discover solutions for negativity. In this book, she expertly applies the most compelling research on self-regulation to the realities of today's parenting, helping you and your family embrace an optimistic new beginning. Discover practical, positive parenting strategies that transform your household from frustrated to flexible. No kid cooperation required! This sample chapter will help you discover 3 key facts for understanding your negative thinker. You will never view your grouchy child the same way again! Dr. Susan Mortweet Van Scoyoc is a board-certified, child psychologist with over 20 years of clinical experience supporting the mental health needs of children and families. She spent more than a decade at Children's Mercy Hospital in the Kansas City area helping children with and without medical conditions improve their well-being. She currently practices at Pediatric Associates of University of Iowa Stead Family Children's Hospital serving children struggling with anxiety, depression, behavior problems, social worries, and poor adjustment to life's stressors. Dr. Van Scoyoc is a best-selling author for the American Psychological Association. She shares her research-based and clinical knowledge about treatments for pediatric behavioral health issues with her fellow specialists. Professionals all over the world use her textbook, Treatments that Work: Empirically Supported Strategies for Managing Childhood Problems, to teach others about effective treatment strategies. She is also the co-author of Parenting That Works: Building Skills That Last a Lifetime, aimed at parents looking to build confidence in their child-rearing skills. Translated into at least four languages, it serves to encourage parents all over the world to focus on the skills their children need to reach their potential. Dr. Van Scoyoc is married and has two children. She enjoys spending time with her family, traveling, and writing. Just like most parents, her children are teaching her more than she is teaching them about just what a kid needs to succeed in today's world! 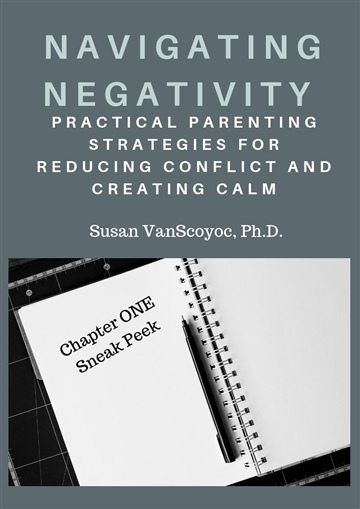 Navigating Negativity: Practical Parenting Strategies to Reduce Conflict and Create Calm by Susan M. Van Scoyoc is a handy guide to all parents out there dealing with children who are negative. The strategies in the book are positive and practical, and will help to transform the ambiance in the household to that of a positive one. Negativity impacts every aspect of a child’s life while growing up, and there is a visible struggle when it comes to self-confidence, coping skills, family relationships, maintaining friendships, participating in new activities, comfort level in unfamiliar situations, and depression. The facts for understanding a negative child, how to reach out and teach a negative thinker, how to parent confidently with a negative child around, and tips for creating calm will help families to get rid of their frustrations, boost their confidence, and have a new beginning. I like the author’s approach to a topic that is relevant but has not been discussed that much. Her experience is evident from the way she has dealt with a difficult topic. Reading this book will be comforting to many parents as it will help them to reach out to their children and make positive changes. Mostly, reading the book will give them hope; they will know there is light at the end of the tunnel. The chapter on frequently asked questions about negativity is helpful to parents when it comes to addressing many issues at home while dealing with the negativity of their child. This book is not only for parents dealing with negativity at home, but also for tutors, educators, caregivers, counselors, and therapists who handle these children.